If you ever take a trip to Swedem, you might see Anders cruising around in one of the nicest 71 Chevelle Super Sports in the country! 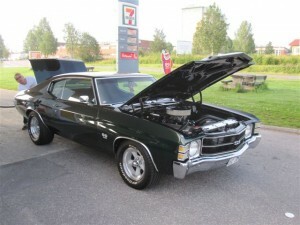 Ander’s 1971 Chevelle SS came to Sweden in 2004 and he is the second owner of the car. The car never had any rust and has a crate motor with a 4 speed transmission and 12 bolt rear end. Anders says, “It is one of the finest 1971 SS Chevelles in Sweden”.